During the duration of our Kickstarter campaign, some people have approached us with concerns that the multi-touch and pressure sensitivity of the Morph might be too good to be true. We figured there is no better way to show them that it’s the real deal than capturing video footage of it detecting some objects we had around the office and sharing it. Our show-and-tell will continue in multiple episodes of Will It Sense. Check out our first episode of Will It Sense below, featuring CEO and Co-Founder Ilya Rosenberg and Product Marketing Lead Stephanie Chedíd. If there’s an object you’d like to see the Morph sense, please tweet the object along with #WillItSense at @senselinc and we might show the Morph detecting it in our next episode! We hope you enjoyed our first episode of Will It Sense, and remember, not everything is too good to be true. 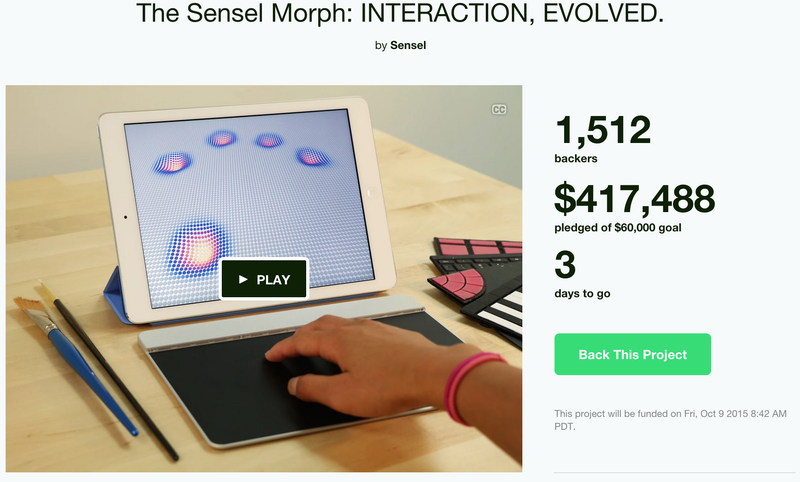 Maker manipulates a robotic arm with pressure-based hand gestures on the Sensel Morph. Ray Kampmeier recently finished a project that enabled him to manipulate a robotic arm using force-sensitive, five-finger hand gestures. To accomplish this, the self-proclaimed hobbyist employed a MeArm, an Arduino Uno (ATmega328), four servo motors, and a servo shield to control the mechanism. 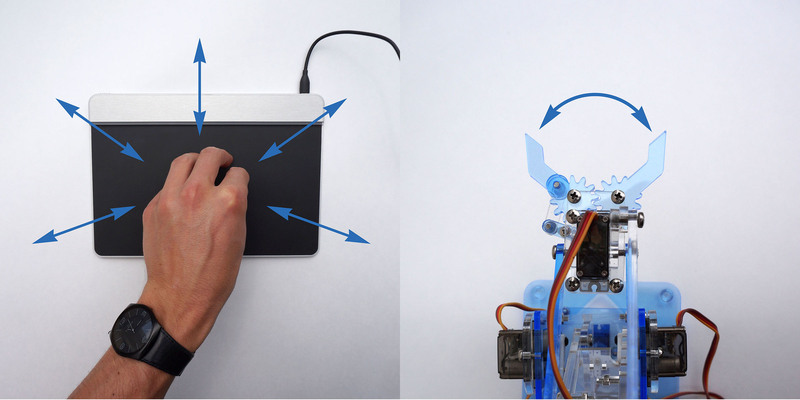 Sensel’s soon-to-be-released touch interface — theMorph — is used to command the robotic arm in four different ways: force down, rotation, pinch and forward/backward. For example, placing five contact points down and twisting the wrist will rotate the base, applying pressure on four fingertips will raise and lower the arm, while moving along its XY axes will extend and retract it. What’s more, Kampmeier reveals that pinching all five fingertips together on the center of the touchpad will cause its attached claw to close. The art that artists create has changed, inevitably, in the last hundred years, but even more drastic is the change in how they create their masterpieces. Today, people often consider themselves either digital artists (using digital tablets) or traditional artists (using paint on a canvas) with few falling in between. The Sensel Morph is empowering artists to explore this “in between” and have the natural, tangible experience of working with their brushes, pencils, and fingers while still simultaneously capturing all of their art digitally. 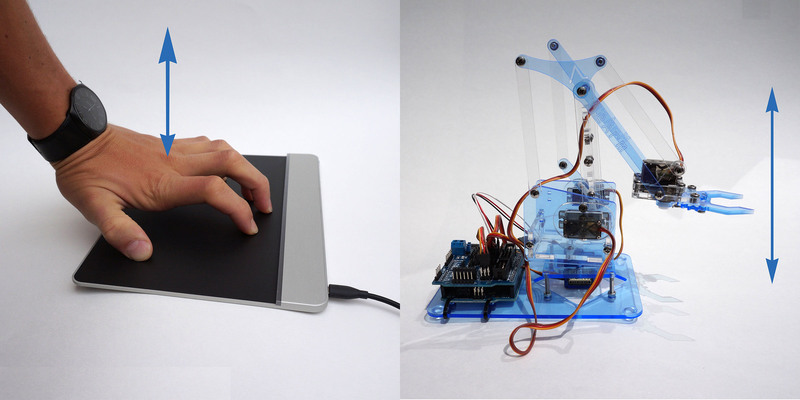 With the Sensel Morph, you can use an actual paintbrush on the surface of the device, and watch the computer pick up the movements and shape of the brush. You can use your fingers and go back to the finger-painting days of your childhood. You can place a piece of paper over the device and sketch directly on to it while sketching in an art program at the same time—The Morph is so sensitive that it picks up all of these. We want artists to have their cake and eat it to. Q: What’s your background, what’s your passion? J: I’m an artist so I’m really passionate about artwork. I like all kinds of new art, classic illustrators, animation, I like a lot of old cartoons and that kind of stuff. I love technology and science as well. Q: Where did you find yourself making illustrations at first? J: I was always drawing during class, I was kinda the guy who got lost drawing in the margins. I always made time to work on my comic book sketches after school. Pretty much whenever I had free time, it wasn’t so much of a “business” back then. I went to school for graphic design but when I came to SF the art directors looking at my portfolio saw that I had all these drawings and recommended I do illustrations and once I saw that it was possible to make a living that way I just didn’t wanna stop. Q: When you were first starting as a professional artist how were you making your art? J: I was more of a traditional pen and paper kinda guy. I had tried tablets but found them kind of annoying at first but when I got a job in animation everyone was using different tablets and input devices. I wasn’t comfortable with them at first but then I finally transitioned over to art tablets to be able to color in my work. Now I mainly complete most of my art work on the computer, but tend to still sketch on paper and then scan. Q: What did you enjoy about using traditional pencils and pens to sketch and what did you feel like you lost when you made that transition towards art tablets? J: The best ideas tend to come about from the interaction between the tool and paper. There’s something that happens with pen and pencil on paper that just doesn’t seem to happen in most other cases. So even now I still start with pencil on paper and then I scan it and color it in with tablets. I moved to using vector-based art programs and re-creating the pen lines on the computer but even now it’s still a struggle with the tools, to make them feel like traditional media and feel the same connection to digital art. Q: How has it been using The Morph? How long have you been using it, how did you find it initially, what was your out-of-the box experience like? J: When I saw the demo and realized how many different levels of pressure-sensitivity it has I knew it this would be huge before I even touched it. The fact that it already supports multi-touch and what that means in the future for drawing software, that was huge too. I was really excited about it. When I got it I was blown away by how delicately it picked up the brushes. I could use my finger and barely touch the surface and see a light line. This is out of the box, with software that hasn’t even been used with it before. I have had it for about two weeks and the experience with it keeps getting better and better. Q: What’s it like to use a regular paint brush on an art tablet? J: Using The Morph with a brush is wild. The painting software I use has a similar brush to one that I was using and it almost matches it identically; the feeling of using a brush and seeing it behave on the screen as it would on paper was really interesting, it’s kind of unheard of. Working with a brush on the device is incredible. Q: What has your work flow been like with The Morph? J: I’ve just been experimenting a lot. I’ve tried everything from a ballpoint pen to a chalky pencil, and using those by putting a piece of paper on top of it—it’s so sensitive that it picks up through the paper with no problem. You can use a colored pencil, hard pencil, ballpoint pen, it just picks all of them up. And you still get that feeling of physical media and it’s so cool. I’ve even tried a fat brush with long even strokes and that works really beautifully too. I’m excited to try other things. Sometimes it’s just so natural to grab the smudge tool and literally just move paint and color around with my finger. I’ve never been able to do that with anything before. Painting with your finger is wild too because it’s like paint is just coming out of your finger-tip. Q: What does it feel like when you’re working with The Morph? J: So far I’m really staying in the zone, it’s wild. It hasn’t taken me out of the drawing in the way that some digital tools do. I’m not thinking about layers, I’m not thinking much about the tool palette, and it’s sensitive enough to adapt any tool I’m using like multiple tools might. I’m able to change it just by tweaking the pressure and size. I was in the zone, I was just thinking about the drawing. The beautiful part about it is that moving paint around doesn’t feel that different from moving paint around with a brush on canvas. I haven’t had any trouble making any kind of leap to do that. I don’t even paint that much but I could have done that all day long. I thought the digital tools for art could only get so good, but this is really encouraging, it makes me realize tech is going to catch up to the point where art created with traditional media and art created digitally could be indistinguishable. The tools disappear and you’re left to your creativity. As the technology evolves and it becomes so natural to use that there’s no hurdle to jump through to create artwork with it, I think people will be able to more easily dive into the digital art world using devices like The Morph. Q: How do you think the art community will feel about this? J: I’ve already told a few of my friends about it and they’re pretty excited. It’s cool to see a device that is doing such a great job combining art and technology. It’s almost like being there the moment the mouse was introduced to computers. I really can’t wait to see everyone’s reaction. A special thanks to Josh Ellingson for choosing The Morph to bring his art to life! Check out the artist’s work here http://ellingson.cc/.